Close your eyes and think of a time when you held a tiny baby in your arms. Maybe it was your own child or grandchild, niece or nephew. Maybe it was the child of your best friend. Sit quietly now, and think of what it felt like to hold that tiny person against you. Feel the softness of his skin, the warmth of his body against yours, and the firmness of his tiny fingers grasping yours. Feel her head nestled into the hollow of your shoulder. Breathe in the fragrance of baby powder. Listen for his gentle breathing. See the pulse of her heartbeat in the soft spot beneath the downy head. Feel the baby’s weight in your arms—so small and yet substantial enough to declare its reality. Now think about what life is like for that baby in your arms. He lives a life of complete trust in the person whose arms embrace him. She has no doubt that what she needs to sustain her will be provided: food when she’s hungry, a clean cloth when she’s soiled, a warm blanket when she shivers, loving arms to hold her when she’s afraid. As he grows and becomes more aware of the one who cares for him, he will love that person with his whole heart. She will beam with joy and throw her arms tightly around the one who is her entire world. Wouldn’t it be wonderful to feel that kind of trusting faith, that confident hope, and that all-encompassing love again? Wouldn’t it be wonderful to live with the utter certainty that the One who holds us is entirely worthy of our trust and will never let us down? Wouldn’t it be wonderful to live knowing that our deepest needs will always be met? Wouldn’t it be wonderful to love fully and openly in response to an unshakeable love for us? The good news in Jesus Christ is that we can, through the new birth that we are given by God’s grace. The new birth is one of the basics of our Methodist way of understanding our faith. In fact, John Wesley said that if any doctrines within all of the Christian faith can be called “fundamental,” they are the doctrines of justification and the new birth. Justification, as we learned last week, is the great work that God does for us in forgiving our sins and placing us in a new relation to God—the relation of beloved children rather than fearful servants. 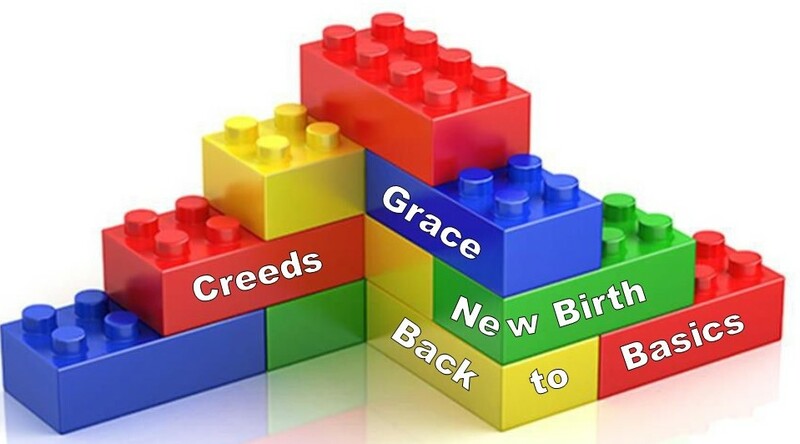 The new birth is “the great work God does in us,” making us the new creation that Paul points to. But then Jesus speaks of the mysterious nature of this new birth by the Spirit, comparing it to the wind: “The wind blows where it chooses, and you hear the sound of it, but you do not know where it comes from or where it goes. So it is with everyone who is born of the Spirit.” The Holy Spirit’s work in creating us anew is not something we can predict or control, any more than we can control the wind. But, just as we can observe the conditions which give rise to a windy day and the effects of the wind’s power, we know what conditions prepare us for the new birth and what effects that new birth has on us. In the moment we are justified, we are born anew by the Spirit. This doesn’t mean that we are instantly made perfect. Just as a newborn baby has a lifetime of growing and maturing ahead of it, we, too, have a lifetime of growing into the perfection God desires for us. The new birth is just the first step in the process of sanctification—the process of becoming more Christ-like every day. But, that new birth does make its mark on us—marks that are the telltale signs of what God has done in us. Those marks are faith, hope, and love. The first of these is faith. We don’t come to God with faith already formed. It is a gift that we are given when we have been born again. If this idea is new to you, you might have to wrestle with it a bit; I know I did. I grew up in the church and called myself a Christian all my life. I thought that I was a good person—I tried to do the right things, I tried not to hurt anyone, I went to church and read my Bible and volunteered. But what I called “faith” in the first few decades of my life was a “head faith,” not a “heart faith.” It was an agreement with all that we say in our creeds. It was a reasoned assent that what I had been taught was true. But, I couldn’t say, as Wesley did, that “I did trust in Christ, Christ alone, for salvation.” I didn’t have the assurance that “He had taken away my sins, even mine, and saved me from the law of sin and death.” My heart had not yet been strangely warmed. Wesley continues, “Such a sense of sin, together with a full conviction . . . that our salvation comes only from Christ, and an earnest desire of that salvation, must precede a living faith, a trust in Him, who ‘for us paid our ransom by his death, and fulfilled the law of his life.’” This is the living faith that comes when we are born of the Spirit. It moves us from “head faith” to the “heart faith” of absolute confidence in God’s mercy and grace, through our Lord Jesus Christ. This is very similar to the effect the new birth has on us. When we are born of the Spirit, we are no longer at the mercy of our sinful thoughts and feelings. We have the power to discern what is good and what is evil, and we have the power to choose which feelings and attitudes will rule our hearts. The difference between us and our Buddhist neighbors is that we know this is not our own doing. It is the power of the Holy Spirit working in us. It is the peace of someone who is happy in God. And, that’s not so hard to understand. As Wesley said, “All unholy tempers are uneasy tempers. Not only malice, hatred, envy, jealousy, revenge, create a present hell in the breast; but even the softer passions, if not kept within due bounds, give a thousand times more pain than pleasure. . . as long as these reign in any soul, happiness has no place there.” The new birth brings peace that fills the space once occupied by those “unholy tempers.” The peace of the new birth is necessary for true happiness, in this world as well as in the world to come. The third, final, and greatest mark of the new birth is love—love of God and love of neighbor. It is, as St. Paul tells us, God’s love that has been poured into our hearts through the Holy Spirit that has been given to us through our new birth. This love joins us so tightly with God through Jesus that it is like having one spirit—the spirit of the living God and the mind that was in Christ Jesus. This kind of love for God frees us to pour out all that is in our hearts to God, knowing that we will be heard by the One who first loved us. Like faith, love bears fruit. The first fruit is love of neighbor. This love includes even our enemies. It goes even further than loving our neighbor as we love ourselves; Jesus tells us to love others as he has loved us. But maybe you’re still wondering, “Why is the new birth so important? I live what I think is a pretty good life. I try to do and say what is right. I come to church and I volunteer. I believe in Jesus. What’s the big deal about the new birth?” The big deal is that Jesus says we can’t fully experience the love of God without it. We cheat ourselves if we don’t open ourselves up to being made new, and actively and sincerely seek being born from above. The new birth is not something we can dismiss. Maybe you feel a little worried that it hasn’t happened to you—that you haven’t experienced the faith, hope, and love that are the marks of the new birth. You wouldn’t be alone. I’ve known that feeling. John Wesley felt it, too, before his heart-warming experience at Aldersgate, even though he was a priest in the Anglican Church. He asked himself, “How can you preach to others if you don’t have faith yourself?” He asked a friend and mentor if he should stop preaching. His advisor said, “By no means.” Then Wesley asked, “But what can I preach?” His advisor answered, “Preach faith till you have it; and then, because you have it, you will preach faith.” Wesley followed his friend’s advice, even though he wasn’t even sure of his own salvation. And then, when he least expected it, he experienced God’s justifying grace. As Nicodemus observed, we can’t go back to being tiny babies, with an earthly lifetime ahead of us. But we are promised eternal life, and the faith, hope, and love that come with being a new creation in Jesus Christ. Whether we’ve experienced this new birth or are still waiting, we can have confidence in the Lord our God—the God who numbers each hair on our heads and knows every sparrow that falls to the earth. With St. Paul, I can say with every confidence, “I am convinced that neither death, nor life, nor angels, nor rulers, nor things present, nor things to come, nor powers, nor height, nor depth, nor anything else in all creation, will be able to separate us from the love of God in Christ Jesus our Lord.” God has promised that all who love him will be conformed to the image of his Son, and we can trust that God will do great things in us. Amen.